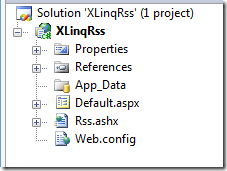 It´s really easy to create XML with LINQ to XML - you can find a HowTo on my german blog. This RSS feature is called "RSS Autodiscovery". At the end of the method the XDocument is saved into the Response.Output. Your RSS items are created in the "CreateElements" Method.